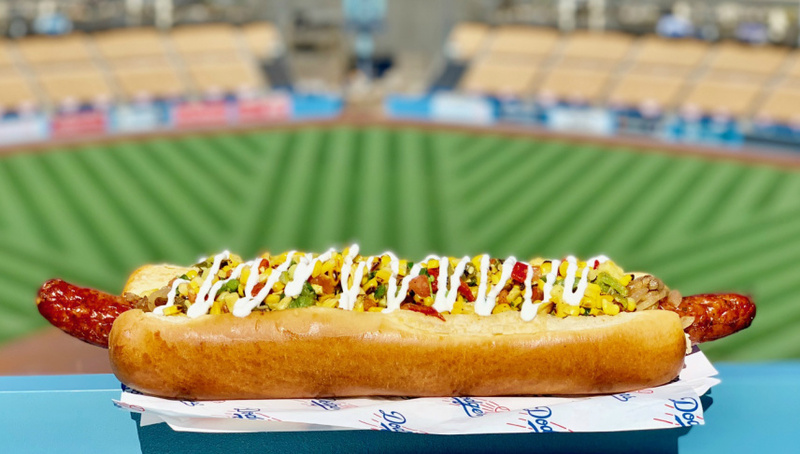 Dodger Stadium has two new hot dogs and one of them is so large and power-packed, you'll think it's Cody Bellinger's bat. Every year, the venue reconsiders its menu, removing items that didn't sell well and swapping out offerings to give hungry fans something new to chew on. But it's tough to make everyone happy. "You're not going to please everybody. The hardest part is accepting that," says Los Angeles Dodgers executive chef Ryan Evans. "But I do really listen to the fanbase. We brought tacos back this year. We added a burrito this year, chicken options, more plant-based and vegetarian options." 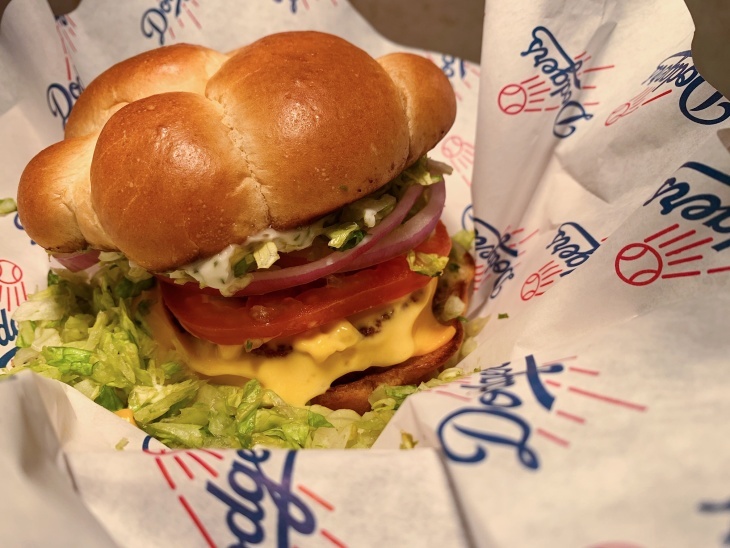 For the 2019 baseball season, the Dodgers menu runs the gamut from insanely gluttonous to satisfyingly healthyish. Vegetarians, you've got options too. Vegans, you'll have to wait a little longer. Many of these options are only available in certain areas of Dodger Stadium. Why? We have no idea. First up, the 747 of stadium hot dogs, an item that did so well when the team experimented with it during last year's post-season, they brought it back. 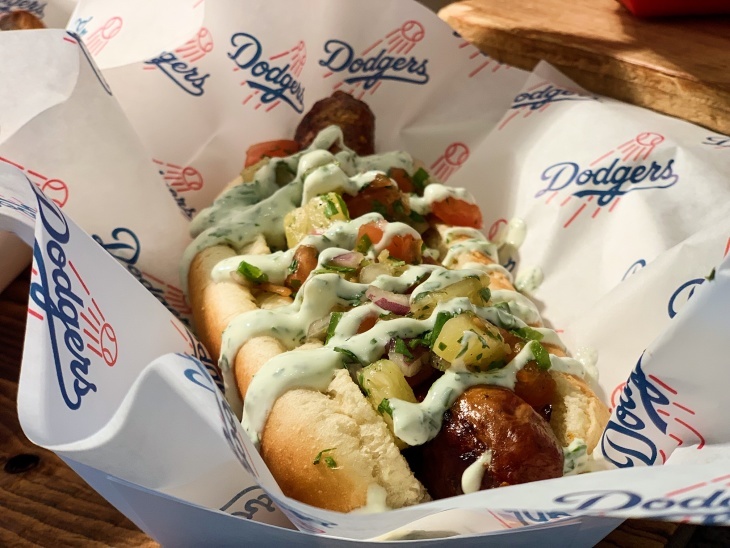 BTW all of the sausages served at Dodger Stadium are made locally by Maestro Sausage Company, which started operating in the 1920s out of nearby Eastside Deli. 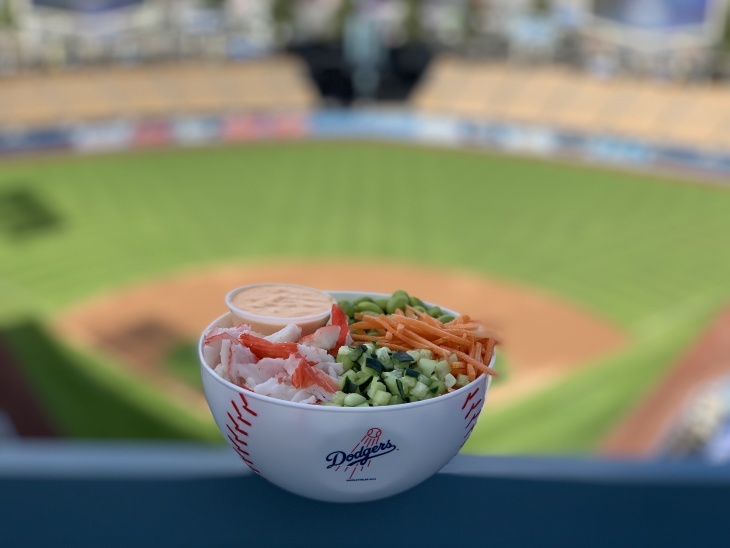 Other new options include a pollo asado bowl (available in Loge 137 and Reserve sections 23 and 24. 13.00), a plate of four chicken or beef tacos (18.00 Field section 10 and Reserve section 13) and a romaine and spinach salad with cucumbers, radishes, feta cheese, either pecans or walnuts and a creamy mint dressing (10.50 Field section 5, Loge section 132 and Reserve section 10). Evans has to balance a bunch of challenges whenever he adds an item to the menu. It needs to be something fans can carry to and eat in their seats. It needs to be possible to make in the stadium's kitchens, which aren't like the kitchens of newly built venues. And it needs to reflect the city. "I love all the different ethnicities in this town and there really isn't any cuisine that we couldn't do here that wouldn't reflect one area or one district of Los Angeles. But when it comes down to Mexican-American culture, how do you bring that to a ballpark that's built in the middle of Echo Park? I think that's always been my goal when I took over here," he says. 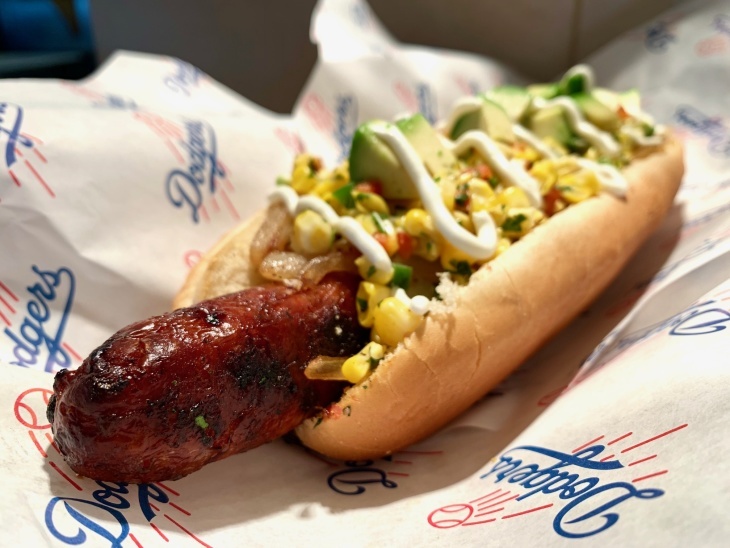 Despite the culinary innovations and switcheroos, Evans says one item reigns supreme and outsells everything else at the stadium: the Dodger Dog. 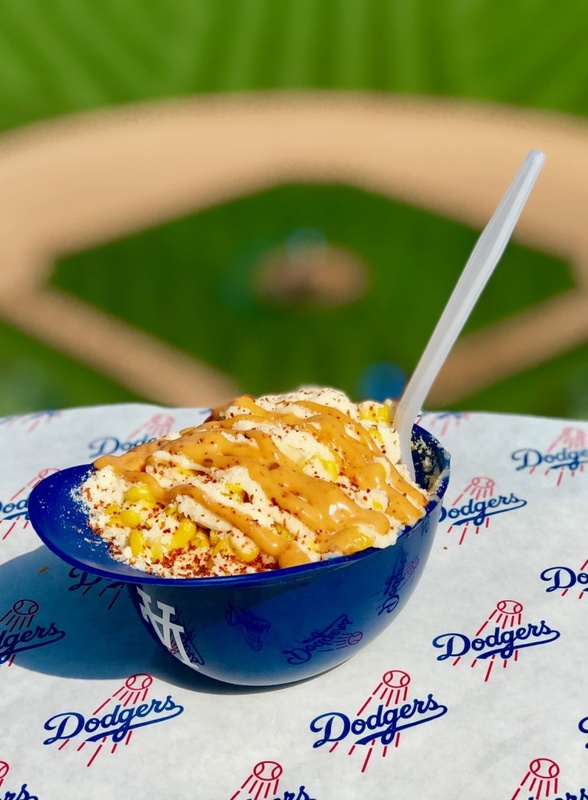 "I like the fancy food, I like to make the fancy food and I like to see people enjoy it," he says, "but there's a lot of purists and they just want the Dodger Dog and a soda."